The preceding discussion about the uraken or backfist has made me think about the related issue of where backfists occur in karate kata and what techniques are often substituted. 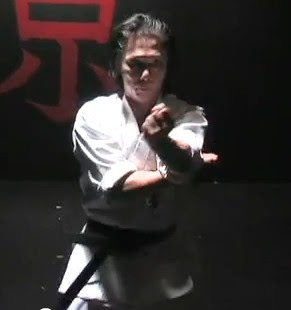 In fact only one technique is regularly interchanged with the uraken - the age ura zuki or rising inverted punch. How this technique functions and where it is "exchanged" for the uraken in kata, are very interesting questions. What is an age ura zuki? In Japanese an inverted punch is called "ura zuki". This is commonly performed as a low, short-range, horizontal punch, which stops just after your elbow clears your ribcage. 1. First, the chambered punch clears the ribs (ura zuki). 2. 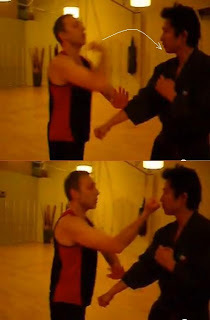 Second, the punch extends into a mid-range vertical fist punch (tate ken zuki). 3. Third, the punch corkscrews over into the fully extended, palm down punch (choku zuki). The ura zuki can also be turned into an uppercut (eg. in the kata seiyunchin) however the punch remains strictly for close-range use. The age ura zuki is unusual in that the ura zuki is extended, palm up, into the mid-range. At first glance this might seem somewhat daft as it contradicts the natural tendency to turn over as you extend your arm - the principle underpinning the corkscrew punch. However there is a good reason for not turning over the hand and this relates to your target and the possible approaches to that target. (b) you can execute a rising inverted strike (age ura zuki). The problem with the vertical fist punch is two-fold. 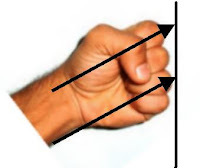 First, whenever you angle a vertical fist punch upwards you run the risk of contacting your target with your smaller, weaker knuckles (as dicussed in my article Punching: alignment and conditioning). As I mention in that article, some arts such as wing chun turn this to their advantage, however I think it is still a risky proposition. The second problem with the vertical fist is that it presents a wider surface area. This means that it is not always possible to access a narrow region such as the throat. As I discuss in the video below, targeting the chin with an age ura zuki produces some rather unexpected and, for your opponent, possibly catastrophic results. 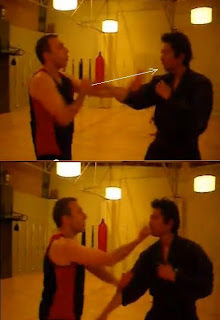 While most people think of targeting the chin from below (with an uppercut) or from the side (with a cross punch), a direct frontal attack is not really contemplated. Possibly this is because we are all aware that the chin is a hard target, and struck straight from the front leaves your opponent's head with "nowhere to go". First, your opponent's chin is pushed backwards, as expected. What happens next is however more interesting. When you push the chin out of alignment with its vertical axis, you break the structural integrity of the body. As I demonstrate in the video, once the head is off the vertical axis, your opponent's ability to resist a force is severely compromised. And this is the "secret" of the age ura zuki: your initial blow will force the head out of alignment - then cause the neck to whiplash backwards with virtually no protection from muscular resistance. Simultaneously, your knuckles target the soft and sensitive under-side of your opponent's chin. Accordingly, the age ura zuki, if it lands correctly, manages to exploit your opponent's lines of least resistance. It not only attacks the underside of the neck, but it does so at a far more forceful and damaging angle than the uppercut (which runs out of steam soon after it passes the chin mark). Simultaneously (and more importantly) the force of your blow effects a whiplash of your opponent's neck, with potentially significant damage to the brainstem. Both the ura zuki and uraken present an inverted fist shape, however their similarity does not end there. Certainly if you use your uraken the way I have discussed in my article "Uraken: karate's greatest folly?" you will be striking with the same knuckles - the 2 big ones. Accordingly I am not surprised that the uraken and age ura zuki are often interchanged in kata. The first, and most obvious, example of such an interchange occurs in the kata naihanchi/naifunchin/tekki. There is a sequence of hand movements in that kata (the same sequence that sometimes features the haiwan nagashi uke) where some schools effect an uraken, while others (including my lineage and that of shorin master Kazumasa Yokoyama - pictured, left) effect an age ura zuki. Which is correct? Arguably they both are. It is possible that the kata designers always intended that the techniques be interchanged, depending on what you wanted to practise at a particular time. The seiyruto uke is like a palm heel block, however the actual deflection is effected using the corner of your palm heel in a circular motion, outwards and downwards. This movement appears in 2 kata, seiyunchin and kururunfa. In the latter it is used as a set-up to an age ura zuki (at least my lineage). In the former it is used as a set-up to an uraken (again, in my lineage). Some schools reverse this, while others use the same technique (eg. an age ura zuki) in both kata. Once again, I suspect that there is no "right or wrong": whether you choose to do an uraken or age ura zuki depends on what you choose to practise. The age ura zuki is a linear attack, angled upward. The uraken uch is a circular downward attack. The knuckles might come to rest on the same spot, but the approach is very different. While it might seem counter-intuitive, the age ura zuki is a deceptively powerful mid-range technique. In order to work, your attacking arm must be low enough to effect an upward angled thrust into the throat or chin. If your arm is not low enough for an age ura zuki, you can instead effect an uraken with a downwards, circling action. In other words, your hand position will determine whether the age ura zuki or the uraken is appropriate in the particular circumstances. Either can be used in kata. In my case, I have been taught to use the uraken in saifa and seiyunchin, and the age ura zuki in naifunchin and kururunfa. What is your preference? I'm surprised you didn't talk more about the tactical advantage of an upward rising centre-line strike - it's difficult to block and somewhat difficult to see. It's a sneaky, fast, and relatively easy technique to do. It's also relatively easy to juice up ... all you've got to do is rise up to the strike and you're hitting the opponent with lots of support from the legs. The rise is of course only if you intend to hit (or solely hit) with a rising inverted punch! As for the corkscrew motion of the normal punch, the corkscrewing path allows the palm to ultimately face downward. This palm down allows you to sink your COG into your front foot, tense up your body and apply the power of the drop into your striking hand. Good job. SOmebody should pay you for this. And you're surprised I didn't talk more... ! Good points Colin - I don't have to say anything about tactics now! I also like the comment about the corkscrew punch and its relationship to the COG. As to being paid... I wish! Dan if you wrote a book on Goju ryu I'd buy it immediately even if it costed fourty bucks! You can be sure I'll pick up that Jodo/jojutsu book, that's something i've been wanting to learn about for a while. Great article by the way (lol). I seem to find that ox block in southern kung fu styles quite a bit, especially wing chun. In fact by the way your structure (barrel chested, pelvis tilted) looked I thought you were doing WC for a second! WHich brings me to a question...The sanchin dachi, white crane sam jian stance, and wing chun triangle stances seem to be similar...are they? Thanks for your kind words and support Joshua. Yes, sanchin, saam chien, san zhan and the triangle stance of wing chun are all related. Yong chun baihe (white crane) and wing chun clearly have a common ancestor - they even have the same creation myth. As to white crane's saam chien / san zhan and sanchin, they are directly related too. See my article http://dandjurdjevic.blogspot.com/2008/05/naming-of-sanchin.html. What is even more interesting is the possible nexus to the san ti posture in xingyi (see the above article). That's been very educational as always. Speaking of a book you may right one day, I suggest title "What is NOT karate" because I believe that's a subject many martial artists do not understand. This story on ura zuki and its difference from uppercut in boxing is an excellent example. As far as ura zuki is concerned I find it makes my arm turn in somewhat unnatural way (unlike uppercut). This may be a negative feature of this punch since in the heat of fight your body will always be more inclined towards executing natural moves. I'm going to do an article in the future on what Bruce Lee called "natural unnaturalness" or "unnatural naturalness". Basically we can't just do what is "natural" otherwise we would all be experts without any training. In the end there is an element of "unnaturalness" to all natural technique if it is to be functional - or some "naturalness" to artificial technique! What might initially seem "unnatural" about age ura zuki is ultimately not an issue, in my experience. I find it a very natural, easy movement. I am writing a book on karate - but somehow finishing these sorts of projects is always a problem for my easily distracted mind! Excellent to hear that you are writing a book. Don't forget to inform us when you publish it. However, it looks like your student is being a bit too cooperative. Was he actually resisting? I bring this up after having read your article about the qi, and, since the logic for this one was somewhat hard to understand from just the text, it just looked a little superficial. The video seemed to almost show two movements to the punch to create the two movements of the head. Not to be picky, but since the video was so integral to your argument, I don't want you to come to wrong conclusions because I always find your other articles to be very inspiring. I hope you get my point. Jeez, no matter how many times I edit this post it seems aggressive almost. "However, it looks like your student is being a bit too cooperative. Was he actually resisting?" Yes, he was resisting - not with total resistance, but he was resisting appropriately to the level of force I was applying. In other words, it was the technique that forced his head back, not his acquiescence. I could have pushed harder and he could have resisted more, but the neck is quite delicate and one should be careful to avoid injury. "The video seemed to almost show two movements to the punch to create the two movements of the head." No, it is one move - ie. a punch. It is the head that does 2 "actions" - the chin pushes in and the head then falls back. "Jeez, no matter how many times I edit this post it seems aggressive almost." Your comments are valid and I don't find them aggressive. All I can say is, try the technique yourself. Just be aware that the move is potentially injurious - hence I'm not doing it hard and fast, nor is my student resisting maximally. However trying it out should give you a fair indication that it works. You can resist an upward force on your chin, but once the alignment is broken (chin is pushed in) the ability to resist an upward force is noticeably impaired. Try it! Thank you for taking my comment so graciously. I know at least one grandmaster who would be greatly offended by anyone who would question his words. I am glad to see that you truly do conduct yourself as a martial artist. Good thing I'm not a grandmaster then! I apologize if my last message wasn’t quite clear. By calling the technique "unnatural" I referred to the fact that muscles on the arm are not aligned as a man would naturally do i.e. in the way of least resistance, which results in that tension one can feel when the arm is extended with top of the fist looking downward. I agree that practice can make one used to this type of motion, but I wonder if one would actually “remember” to use such a technique in the heat of fight. I’ll be free to say that even in your demonstrations posted on this site it’s hard to find ura zuki (except in this article of course) as a follow up after blocks or so. Again, this is not to say that this technique itself is either impossible or ineffective but we should be aware of it shortcomings when thinking about accepting it into our armory. As far as your intention to write about natural and unnatural in martial arts, I’m certainly looking forward to reading it. It's something I've been trying to learn more about for a long time. I appreciate your argument Edward, but my response is the same: what seems "natural" to a person who has not extensively practised age ura zuki and one who has are 2 different things. And what one reflexively does (as opposed to "remembers") will also be different. I find I utilise age ura zuki in free sparring a whole lot. It feels no different to me than any other technique - nor do I feel any particular tension. Again - it is a question of what you're used to. That's the best answer I can give! However, it looks like your student is being a bit too cooperative. Was he actually resisting? A punch typically has a lot of power front and back just due to the body's anatomical structure. Most punches should be done with some relaxedness, acceleration and then with an instantaneous lockdown of muscles which Dan describes as a deceleration point. In terms of left and right, and up and down resistance however, the extended arm has relatively little power. I can literally swipe a punch out of the way with finger power. Was this the resistance you were asking about? I don't often see instructors who are both verbose AND who make sense.